Two Arriva drivers and 22 passengers were injured, two of them seriously, in a collision involving three buses at Portes des Bombes this afternoon. 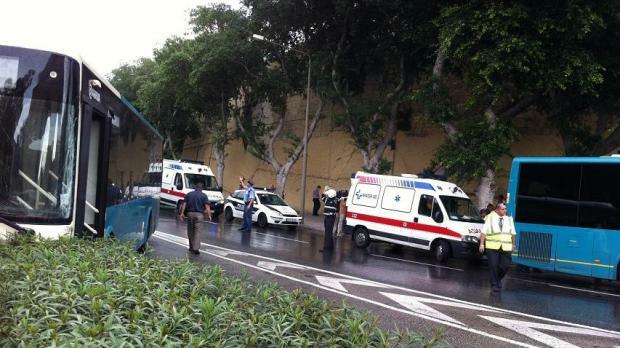 Sixteen were hospitalised and the rest were treated at Floriana health centre. None of the injuries are life-threatening. 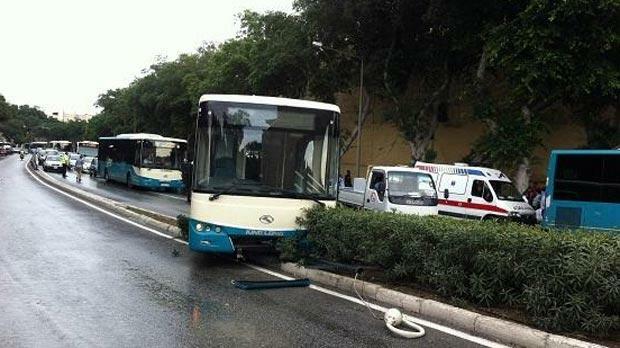 The accident happened at about 3 p.m. when a bus heading out of Floriana crashed into the side of Portes des Bombes. It tore off part of its side and dislodged stones off the gate. 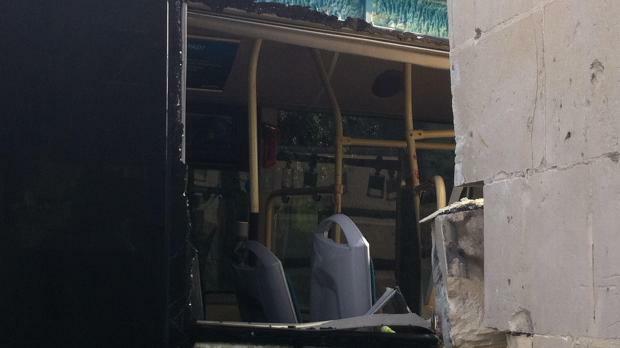 Two other buses then crashed into each other, with one of them then crashing into a centre strip. Damage included a smashed windscreen. 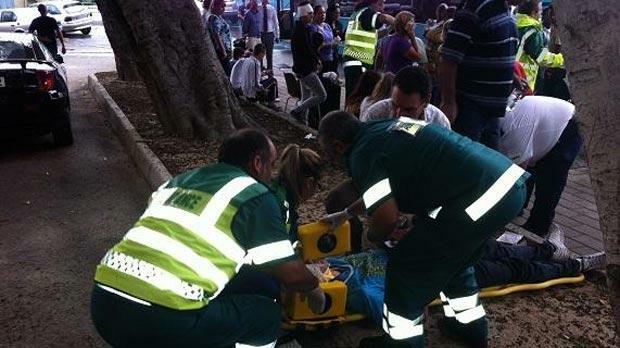 A fleet of ambulances arrived on the scene within a few minutes and the injured were given first aid on site. One passenger was seen being placed on a stretcher with her neck in a brace. Others were seen with blood on several parts of their body. Arriva said that one of the two seriously injured persons is a driver. 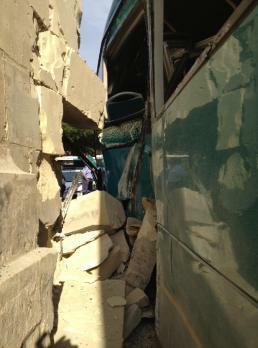 Some of the passengers who were not seriously hurt were taken to Floriana health centre in another bus, accompanied by a nurse. The road was closed to all traffic after the accident and a big traffic jam built up in St Anne Street. At one time there were 14 buses stopped on the lane to Marsa between Portes des Bombes and the lion fountain while another 12 buses were crawling along behind them and being diverted towards the Mepa offices. "All three buses involved in the incident were purchased new for the contract and were 12m rigid buses registered for use in June 2011 and as such are only sixteen months old. "The cause of the incident is unknown at this point and we are fully cooperating with the Maltese authorities in any investigation. "Our incident investigation team on the scene have confirmed that road conditions at the time were wet following a heavy rain shower and there appeared to be traces of an additional substance mixed with the water on the road surface, thought at this point to be diesel." In a statement, Mater Dei Hospital thanked all Accident and Emergency personnel who assisted those injured in the accident. It said the A&E incident plan was immediately activated and followed accordingly. "At 2:50 p.m. the A&E control room received a call to assist a number of injured people involved in a road traffic accident. Ambulances were dispatched immediately to site. Two A&E consultants were deployed to the scene to assess the situation while other five A&E consultants took over the hospital's A&E department while various other professionals including nurses and other paramedics and MDH senior administration were assisting with the situation. "A total of 16 patients were seen at the A&E department None of the casualties are in danger of loss of life and most of them will be discharged home. A few are still being treated at the A&E department and may require further in hospital observations. "The patients admitted to MDH were all Maltese, save one Italian, one from Somalia and one from Congo. 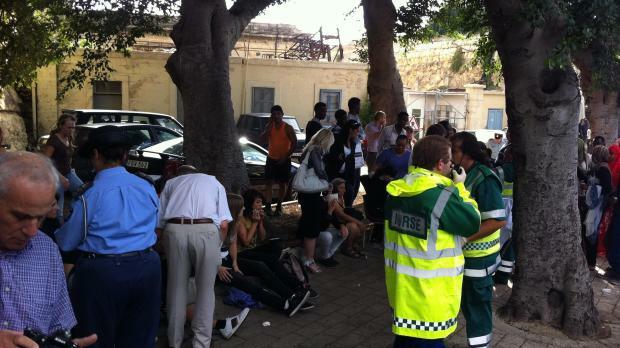 A number of people were given treatment at the Floriana Health Centres for minor injuries sustained." In a statement the police listed the injured and their condition - although the definition of serious injuries appears different from that of the health authorities and Arriva. The drivers were a 26-year old man from Qormi, a 44-year-old man from Hamrun and a 32-year-old man from Congo, resident in Sta Venera.